Ilhan Omar Never Stood a ChancePolitical attacks against the Muslim Minnesota congresswoman — culminating in one from the president — have devolved into pure Islamophobic id. If You Are Defending Stephen Miller, You Are an Ally of Anti-SemitismMiller’s white-nationalist politics are far more dangerous for American Jews than anything Ilhan Omar has ever tweeted. The GOP’s Cynical New Identity-Politics PlaySenate Republicans are looking to back bills that rebuke anti-Semitism — despite their own party’s complicity in anti-Semitic violence. Two Dozen House Republicans Oppose Anti-Hate Resolution for Some ReasonYou say you want a resolution? 4 Reasons Republicans Are Keeping the Heat on Ilhan OmarOmar is a convenient target for Republicans hoping to distract attention from their own and their president’s extremism. Democrats’ Split Over Ilhan Omar’s Israel Comments: What You Need to KnowAfter much debate, Democrats will vote Thursday on a resolution to condemn hate in all forms. Steve Scalise Delivers the GOP’s Most Cynical Ilhan Omar Rebuke YetScalise admitted to attending a white supremacist event in 2002. Now he is lecturing Americans about national security and anti-Semitism. Ilhan Omar Has a Less Bigoted Position on Israel Than Almost All Other DemocratsMaking tone-deaf remarks about dual allegiances is bad. Supporting de facto apartheid rule in the West Bank is much, much worse. Can Anti-Semitism Split Democrats Like It Split Labour?Ilhan Omar and the specter of Jeremy Corbyn. Ilhan Omar Accuses Israel Hawks of ‘Allegiance to a Foreign Country’After skirting around anti-Semitism a few weeks ago, Omar goes all in. The GOP Used Crocodile Tears About Anti-Semitism to Abet Mass Murder in YemenMcConnell used an amendment condemning anti-Semitism to block a vote on ending support for a Saudi War that’s put millions at risk of famine. Mike Pence Makes Strong Case for Donald Trump’s ResignationThe vice-president argued Tuesday night that “those who engage in anti-Semitic tropes” have no place in our politics. Alice Walker’s Terrible Anti-Semitic Poem Felt Personal — to Her and to MeThe “Jewish soul” in her screed was her ex-husband and the father of her child. Can the Women’s March Survive Its Latest Controversy?The organization has had a very bad week. Jewish Columbia Professor’s Office Vandalized With Large SwastikasAmid a nationwide uptick in anti-Semitic hate crimes. Ilana Glazer Event at Synagogue Canceled Over Violent, Anti-Semitic GraffitiHateful messages like “Die Jew Rats” were graffitied on Union Temple of Brooklyn in Prospect Heights ahead of the political event. Trump’s Ideology Is Anti-Semitism Without JewsHow the president mainstreamed anti-Semitic conspiracy theories. A CUNY Student Was Investigated for Criticizing IsraelWhen one student can narc on another for being offended by their political opinion, things start to get pretty Kafkaesque. Democratic Party Mailer Associating Cynthia Nixon With Anti-Semitism BackfiresIt was roundly condemned over the weekend, and Governor Cuomo was forced to distance himself from it. Corbyn, Netanyahu Tangle Over Corbyn’s Involvement in Tribute to TerroristsThe accusations of anti-Semitism that have trailed the Labour Party aren’t going away anytime soon. D.C. Councilman Apologizes for Claiming That Jews Control the WeatherHis comment comes amid a rising tide of anti-Semitism in America. Why Won’t Women’s March Leaders Denounce Farrakhan’s Anti-Semitism?Women’s March leaders seem to be tiptoeing around hate speech that demands a firm response. Norwegian Band Taake Cancels 10 Tour Dates Amid Anti-Semitic AccusationsThe Norwegian black metal band has canceled ten shows of its upcoming 19-date North American tour. Roy Moore’s Jewish Lawyer Is a ‘Passionate’ Doug Jones SupporterTouted to refute charges of anti-Semitism leveled against Moore, the Jewish lawyer voted and raised money for his opponent, Doug Jones. Hot Irma Cop Turns Out to Be Anti-Semitic Milkshake DuckOfficer Hamill’s Facebook posts included several jokes about concentration camps. Want to Buy Ads Targeting ‘Jew Haters’? Try Facebook!ProPublica reporters used Facebook to buy ads targeted at anti-Semites. The Anti-Semitism Around Donald TrumpWhy does he seem so willing to enable a dark form of nationalist politics? Reports: Sebastian Gorka to Leave White HouseIt looks like Gorka, who has been linked to anti-Semitic groups, will soon have to wage his “war of ideas” someplace else. Sebastian Gorka Spoke Out in Support of a Racist, Anti-Semitic Hungarian MilitiaThis is just the latest sign that Gorka, ostensibly a counterterrorism expert, has deep ties to Hungary’s far-far-right. Senate Calls for ‘Swift Action’ As JCCs Face Another Round of Bomb ThreatsThis is the sixth wave of threats, and 110 institutions have been targeted. Maybe the Media Shouldn’t Cover Every Single Hate-Crime ThreatIn an age in which any idiot can issue an anonymous threat, the current approach is just asking for copycat acts. FBI Charges Former Intercept Journalist With Making Threats Against JCCsFired by the Intercept last year for falsifying sources, Juan Thompson apparently made the threats in an attempt to harass an ex-girlfriend. As Many As 100 Headstones Vandalized at Jewish Cemetery in PhiladelphiaIt’s the second Jewish cemetery in the U.S. to be vandalized in as many weeks. Trump’s Security Adviser Sebastian Gorka Has Links to Anti-Semitic GroupsThis may be the lowlight of a week that also saw him make an unhinged phone call to a critic that got recorded and published. Trump Manages to Denounce Rise of Anti-Semitic Incidents Without Taking OffenseFinally abandoning a habit of attacking reporters who asked him about anti-Semitic incidents, Trump simply addressed the subject appropriately. 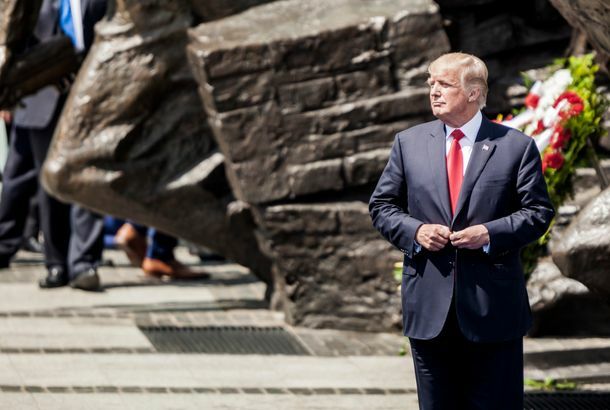 President Trump Faces Pressure to Address Rash of Threats Against Jewish CentersIvanka Trump and the White House issued statements, but the president has not discussed the incidents specifically. 10 Things We Learned at President Trump’s First Solo Press ConferenceHighlights from the president’s 77-minute tirade about how dishonest the media is — and how racist he isn’t. PewDiePie Apologizes for Anti-Semitic Jokes … and Then Blames the MediaThe YouTube star lashed out at The Wall Street Journal. Trump Says He’s the Least Racist (and Anti-Semitic) Person You’ve Ever SeenThe president then asked a black reporter if she were friends with the black caucus – and denied the existence of recent anti-Jewish hate crimes. Disney Drops YouTuber PewDiePie for Anti-Semitic ContentPewDiePie, the world’s highest-paid YouTuber, has reportedly posted nine videos since August containing anti-Semitic content.